The lovely people at Rodgers of York challenged me to make my own cushion this month, with the aid of a lovely new sewing kit and some Sanderson fabric. Now I’m not renowned for my sewing skills, but my eldest daughter (aged 11) is, so I put her to work and here’s what we came up with. 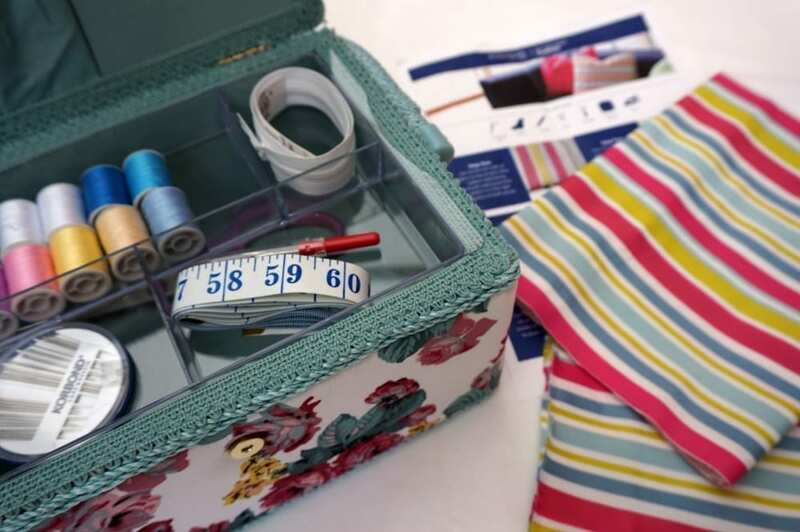 I also have a full kit including sewing box, fabric and inner to giveaway so jump to the bottom of the page if you want to enter straight away. We were sent full instructions, but to be honest it’s pretty straightforward. We also used a sewing machine, but you could potentially sew by hand. 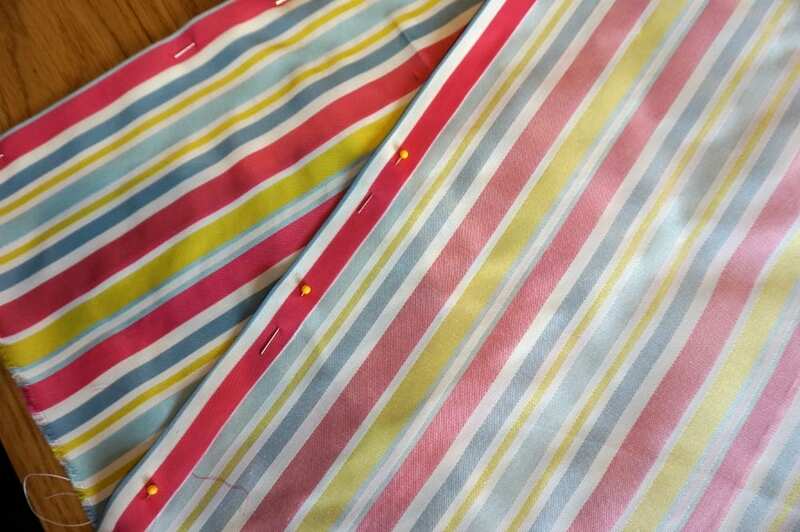 The candy stripe fabric is bright and cheerful and will suit many rooms; we’re going to use it in one of the girls’ rooms once all the house renovations are complete. Placing the pieces face down we ironed and pinned a 1.5 cm edge along one side. This then allowed us to attach each side of the zip. Once the zip was attached, we folded one side over onto the other (right sides together) and sewed around the other three edges. Finishing the edges and turning the material in the right way meant we were pretty much done. 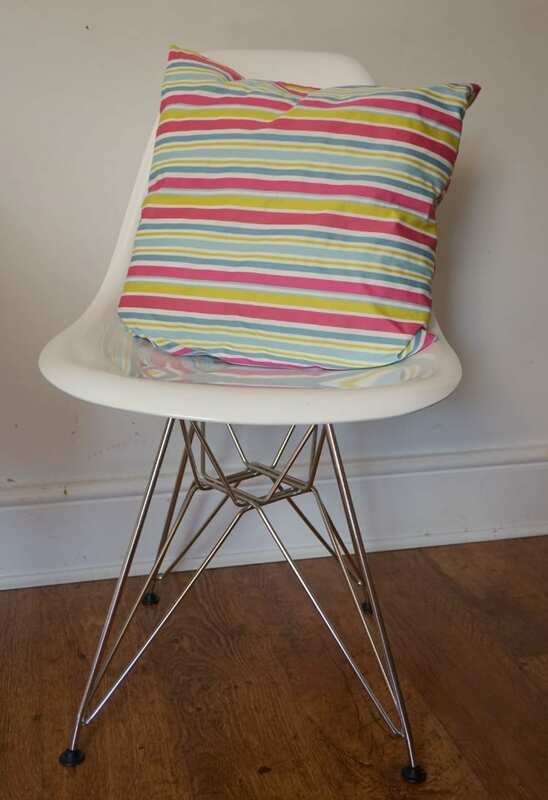 Next we inserted the cushion pad, and hey presto, our Sanderson fabric cushion is now complete. To win the above kit to make your own candy stripe cushion just follow the instructions in the Rafflecopter below and tweet the message to enter. Full T&C’s within the Rafflecopter widget above. This cushion wouldlook lovely in our back porch! I like to sit in there to read as it is so sunny and warm! I have an old rocking chair in my bedroom that the cushion would look beautiful on! It would look lovely on the chair in our hallway, would brighten it up! I love to sew but sadly no matter how hard I try, I never quite get that professional look. I’m convinced tho, it’s because I never seem to quite have all the right bits and pieces so make do with what I’ve got. Thus the tatty result! The sewing set you have in the competition would save me from another disaster and bring down my stress levels to zero! I’d use it on my bed as it will match my decor. I’d use it in the bedroom. On my couch in the living room, its a six seater, so we need a lot of cushions! Brighten up the living room! Wife says she would use it in her sewing room, which is actually the spare bedroom….. I would love to take this into our roof garden when I am sneaking a half hour book break. I’d gift it to my sister in law. On my sofa in the living room. I would use this lovely cushion in the living room on the main couch! In my armchair…I’d want it on display!!! I would use the cushion in my new conservatory. Thank you. I would give it to my daughter in law as I have just started to teach her to sew. This cushion would fit in perfectly in my bedroom. We have just done our bedroom up in yellow and bright colours so this would be a fantastic addition to our new furnishings. 🙂 Thank you! I’d have mine on the garden seat. I love the colours of the stripes. We have just bought new sofas for our snug and I like the idea of lots of coloured cushions to brighten them up. This may inspire me to try making them! Would love this for my living room. In my bedroom 🙂 Love the colours and it sounds so easy to make! Well done to your daughter for making the cushion. If I won I’d give it to my daughter so she could make it and then sit it on her bed. I would put it in my extension which has just been decorated and is in need of some accessories. I have a lovely craft room with a day bed on which it would look lovely.